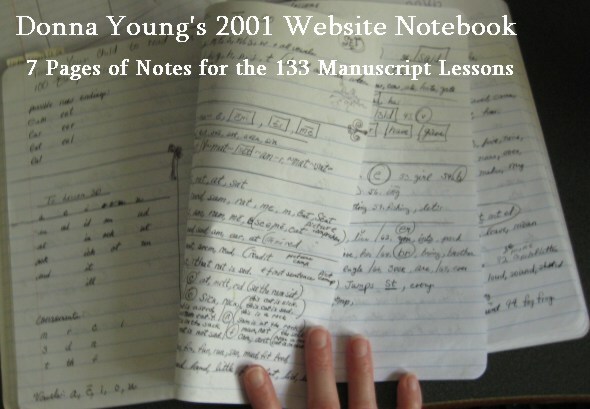 Sometime during 2001, I had the idea to make handwriting lessons to go along with the book, Teach Your Child to Read in 100 Easy Lessons. Since I had already devised the Targeted Manuscript Teaching with the letters broken into steps, I decided that because this handwriting lesson set might be used for beginners, I would break the letters down in steps as well. That is why the letters on the introductory lessons are broken down. I used Teach Your Child to Read in 100 Easy Lessons successfully with my daughter and I used its sound chart with my son, who had either never learned to sound out words at school or he had forgotten how to sound out words. Either way, he was dismayed that his little sister who was 3 grades behind him could pronounce words that he could not. It was good for all of us to teach him sounds with the chart. Not long after that, I made sound cards and sat down with both of my children for lessons. All of the handwriting lessons are in PDF [portable document format] and require the free Acrobat Reader. I made the lessons in a paint program using the font: Print Clearly. The letter height is approximately 1.5 inches tall, so this set is appropriate for beginning handwriting lessons. The set includes 133 handwriting worksheets, 14 word flash card printables, and 3 sets of letter cards. The lessons are coordinated with the book, Teach Your Child to Read in 100 Easy Lessons. You may use the lessons even if you are not using the book.